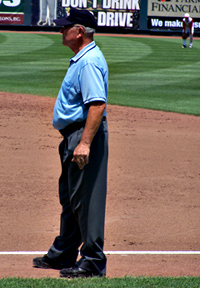 Umpire Gary Paulsen has worked 40 state tournaments. A central Iowa man who has appeared in more state high school baseball tournaments than anyone else stepped off the diamond for the final time Monday. Gary Paulsen of Ogden umpired his last game during a record 40th appearance at the State Baseball Tournament. He’s been calling balls and strikes for more than five decades. Paulsen called his first game as a junior in high school, joining his father and uncle on the diamond. “I was fortunate to work in the 50s and 60s with my dad and my uncle, in the 80s and 90s with my son and then, in the summer, I broke down and trained my grandson. So, that’s four generations of stupidity or whatever you want to call it,” Paulsen said with a laugh. “It’s been fun and I’ve actually been (umpiring) since probably 1957.” In addition to his family, Paulsen credits his long, successful career to good health and a lot of luck. Paulsen is also an accomplished basketball, track and football official. He was inducted into the Iowa High School Baseball Coaches Association’s Hall of Fame in 1993.